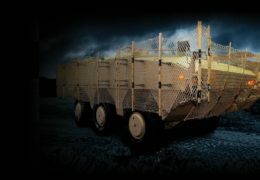 It is this most recent system which is now fitted to a variety of UK military vehicles following the company’s £10.6M contract award from the UK MOD on 21st December 2012. Tarian® is a highly effective solution for protection against RPGs and also the world’s lightest. Developed in close collaboration with the UK Ministry of Defence (MOD), the Tarian® system has been extensively tested – including over 750 live shots – in the UK, France and the USA. This testing has verified Tarian’s high level of performance and multi-hit capability. Tarian® was launched in 2009 and is currently in service fitted to a wide range of vehicles deployed by the British Army in Afghanistan. The core element of the Tarian® RPG defeat mechanism is an extremely strong textile net manufactured from high-tenacity fibres. Tarian® nets are attached to vehicles using a robust flexible mounting system to withstand harsh vehicle operating conditions with low susceptibility to damage. Compared with traditional bar armour RPG protection, Tarian® provides significantly improved protection performance and, being significantly lighter, enables vehicles to operate more efficiently. Meet AmSafe Bridport Ltd’s team on stand 4010S in Hall 4 and see Tarian® mounted on a purpose-built demonstration rig.